From time to time, I receive emails from people who question whether I'm "for real" or if I really do share free money with people who email me. Actually, I get those kinds of questions every single day and it's understandable. It's such an unusual thing for someone to give something away with no strings attached and asking nothing in return. So I really do understand the occasional skeptic. Now, it's not my obligation to provide proof of my giving. I take people at their word when they say they need money. And in turn, I hope that others take me for my word when I tell them that I am giving money away to people in need. Well today, for whatever reason, I had a camera with me when I stopped at a post office to drop off 3 letters to some nice people who recently requested some assistance. Xavier from Georgia needed $50. And Danielle from Florida and Rachel from Tennessee will each receive $20. 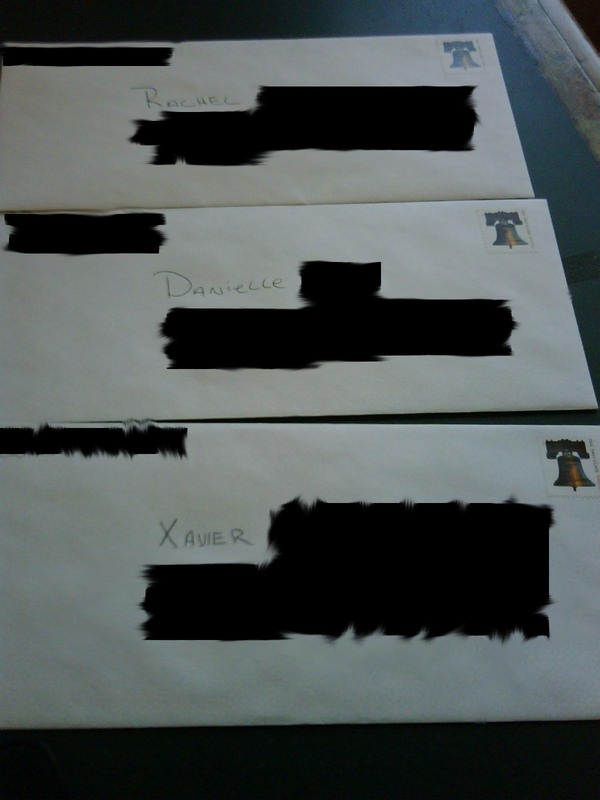 I decided to take a picture of the envelopes before I dropped them in the mail. I've obscured personal details to protect the recipients' privacy. If nothing else, I hope seeing real pictures of real envelopes going to real people who really need some help will inspire confidence in those who write. Know that even if I don't reply to your email, at least I read it and consider it. And who knows. You may one day see your name here too. I know that Rachel and Danielle asked for more money than $20 each. But sometimes I am not able to fulfill every request for the exact amount someone asks for. Twenty bucks doesn't go far. But it might be a way to buy a little lunch for a family or some school supplies for the kids. When times are tough, every bit helps, or at least I hope it does. If you have a request of your own, I'm looking forward to hearing from you. If you don't need help, consider taking the time to help those who are in need. And as always, have a good day everyone. I think that what you do is the cornerstone kind of thinking that people need in their lives. Like a "pay it forward" kind of thing. It has always been true that to give is better than to receive. Thank you for what you do because we all need a sense of hope in our daily lives and its people like you who boost the rest of us up! I have been reading your blog posts. And I only wanted to say to you that even if you can't help me I still appreciate you showing me that there are still good people out there that truly care for others. That there. Is hope and even on a dark day you can find a smile. Thank you for my smile tonight, you not only lit up my face but,my Heart as well. Well its good to see that you are helping people. I hope that you visit my blog so that you can see the kind of help I need. But I will send you a request privately because I really could use some money for food - especially so I can buy a turkey for Thanksgiving. I don't know how real this is but if it is God Bless you and I wish their were more angels like you in the world that help people less fortunate! I don't know if this is true or not but if it is hats off to you Santa. That's just awesome. I love stories like this. I hope your blessed with lots of family and friends. That's what life is all about. You seem like a very good person. You must believe in God. I wish all people were like you, the world would be a much better place. I already submitted a request for $1000 but will take more if you decide to give it. God blesses us every day and I believe that one should always give back a portion of what the receive, and I will do so if you give me money or not. I will pray that you will give me this money, I will use it to get a car and pay my bills and serve as an example of God's grace and mercy. I found this blog while surfing the internet for money-making ideas.I had this VERY idea not 2 days ago. Exactly! I hope I can one day do it too, but at 49 I'm not sure I'll get the chance. People in need can find more resources at my website. I really hope that you are blessed in every aspect of life even if you aren't able to help me out. I know you are only one person and money does not grow on trees but i believe what you are doing is amazing. Thank you for helping people. I hope people learn from this and those that can do. i also hope that people do not take advantage of you. I promise to help others with what I can, without expecting anything in return. :-) helping people, one dollar at a time. Thanks for hope of descent human beings. Even if you can't help your still a blessing. Much appreciation.
. Thank you for what you do because we all need a sense of hope in our daily lives and its people like you who boost the rest of us up! I just found your site... what you are doing is absolutely wonderful. I am ever grateful for the good you are putting out into the world. I stumbled on your site by accident, and I am making a request. Even if you are unable to help me, I just wat to say God Bless you, for being the kind of person people only dream exist. For being exceptionally for kindness' sake. I don't need to make a request or anything now, but I just wanted to say I think it's great you're doing this! I read the post and comments. All I have to say is WOW and Lovedbyu, you can be like this person. All you have to do is give when you don't have to. It does not have to be money! People need more than just money! They need kindness, the door held, understanding. There is so much you can give the world. All you have to do is care. However money would be nice. I always wanted, since I can remember, to build a man powered water plant in Africa. Everyone has a job and no one needs water. The best of both worlds. Give a man a fish, he eats for a day. Teach a man to fish, he eats for a life-time. Since God is love, it would be wise to imitate him. True spirituality comes from an obedient, giving unconditional heart. Remember its better to give then to receive. You'll get some much more back in the form of true happiness. The world is so crazy that people have a hard to believing that there are people out there that geninuely care. If you offer something for free no one takes you seriously. They feel you must want something in return because "nothing is free". I also offer free gift cards on my site, but only a few people have been able to receive them because I assume people don't believe it. Oh, well. You've inspired me to keep on doing what I do. Thanks. I am in tears just reading all these comments...wow. There are some real kind people out there indeed! When I start making money; I would like to partner with you and help others as well...what joy! a random act of kindness i saw this on a movie before called pay it forward, this is a way to change the world one person at at time.I wish i could do something like this, who ever you are you really give me hope i just want to say thank you from the bottom of my heart for letting me kn ow good hearted people still exist. I read the comments on this page, and I just want to know... where are all the people who have received money from this person, and why have none of them left a comment to say thank you to this person for money they have received? Are people really that ungrateful, or what? Without money none can lead happy life. So, live happily with the money. How do i request money? ?